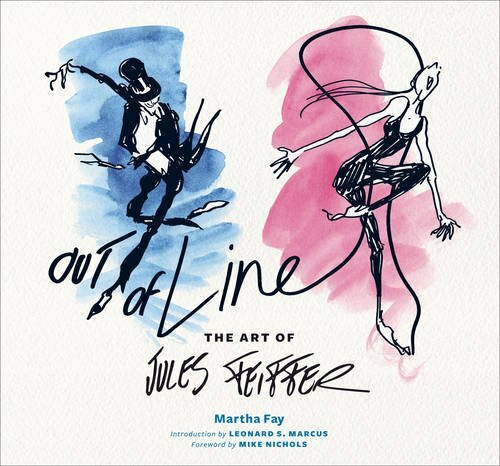 Out of Line: The Art of Jules Feiffer is the definitive book that provides the full retrospect of one of America's pioneering cartoonist. The publisher Abrams and author Martha Fay has done a terrific job with this huge 272-page hardcover. Content in the book is arranged in chronological order. It starts with the childhood where we are shown the many early drawings and photographs, and also example artworks from other artists that inspired him. Then Feiffer went on to work for Eisner to ghostwrite for The Spirit. After that he got drafted into the army and talked about how disillusioned he became. After the army was the period of creative production where he experimented with different styles. Finally he got the job at Village Voice to go on to produce the comic strip Feiffer that ran 42 years. Wow! You'll get to see a selection of those comic strips in the book. There's also mention of the various other jobs he took, such as writing for plays and of course the many children books he wrote and drew for. This is a insightful retrospect worth getting if you want to learn more about Jules Feiffer.